marlene b. creative: My First Earthquake. For numerous, inexcusable reasons I was still dozing in bed at 9am Wednesday morning. Grey light peeked through the blinds and the room was cold from excessive air-conditioning. My husband was at work, the house was silent. Then the bed shook. It felt as if someone sat on the mattress, although I knew no one was there. Then the entire bed began to shake and I sat up, now fully awake. The earth was moving – it was my first earthquake experience in Japan. We have very little furniture, nothing on the walls, and no knick-knacks, so all I heard was our aluminum mini-blinds all over house tinging and clinking was they shimmied in their window frames. It lasted maybe 10 seconds, 15 tops. When it was over I jumped out bed. As I quickly changed clothes I actually thought to myself that wearing my nicest satin pajama pants was good-thinking because if the quake had been the “big-one” at least I would look decent during the chaos. I felt no aftershocks and we never lost electricity or internet connection. I was online within minutes looking for information. 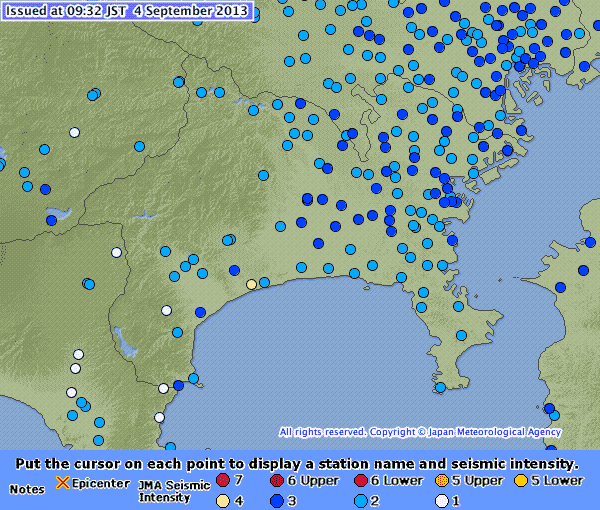 Japan utilizes an Earthquake Early Warning system that quickly alerts the public through multiple formats. About a month ago I received such a warning, though I was far from any affected area. I did not hear an alert on my phone this time, and even through my earplugs I would have heard it and felt the phone vibrate under my pillow. Hence I installed the Yurekuru app on my phone that translates these warnings into English and allows you to adjust sounds and settings so as not to miss future warnings. The Japan Meteorological Agency website (which has an English option) was bogged with traffic and it took multiple attempts to access it's Earthquake Information page. 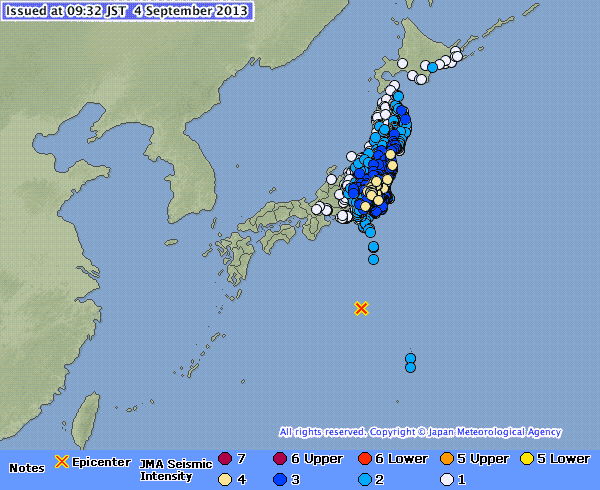 The first image below includes all of Japan and indicates the earthquake's 6.9 magnitude epicenter. The second image shows locations in Kanagawa Prefecture and our area, Sagamhara-Minami, which recorded the quake at magnitude 3. This was not the first earthquake since we moved here, but it was the strongest and the first one I actually felt. I'm not sure if I would felt it if I had been out of bed though. Our temporary mattress is horrendous, only one step above an air mattress, the slightest movement disrupts the entire thing. Earthquakes are common here and this experience certainly conjures concerns for me on the next one, or even the “big one”. We are practically required to have emergency supplies, including food and water rations for people and pets, and to keep important documents and records organized in one location in case of an evacuation. I now understand more the urgency for these preparations, even though the likelihood of a disaster is rare. Looking back only a couple years to the Tohoku earthquake and tsunami is a sobering reminder of what can happen and how even a little preparation and a little bit of warning can change your life. Clothing and Canned Goods, Update.